of seeing the same problem. In other words, for children to be able to see and understand different points of view they need experiences in perspective taking. Since Vea is an atelierista, her examples naturally emphasize children working out different points of view through various forms of representation. I would like to play with the same idea of perspective taking at the sensory table. To do that, I will use documentation from 2012 around an apparatus called Big Box on Top. I acquired a large box and decided to place it over the table. I cut big openings on two sides of the box. I cut notches in the bottom panels of the box so I could slip the box over the lip of the table on two sides. That allowed me to securely fasten the box to the table. I embedded cardboard tubes of various lengths through the box. With this apparatus there are a multitude of ways children can experience different perspectives. From the outside of the box, they can pour and watch the corn go down a cardboard tube. Or they can take the opposite perspective by catching or blocking the corn coming down the cardboard tube. 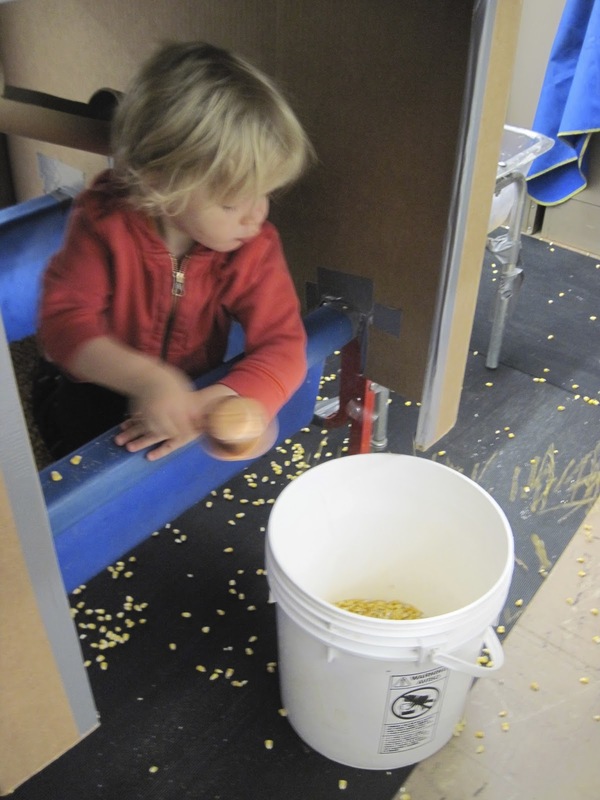 For a little bit different perspective, the children can reach into the box to pour and see where the corn goes. By wedging her head inside the box, another child is able to gain yet a different perspective. She can see the corn flowing in the tube through a hole cut in the tube. If possible, children will always ask what does it feel like to be totally under the box inside the table and how does that change the experience of transporting the corn out of the table into a bucket. Or, what does it feel like to inhabit the space under the box inside the table with others? It is certainly imperative to understand where your body ends and another person's body begins in this tight of space. Here is an example of perspective taking that is a little more complex. One child is in the table under the box and the other child is outside the box. The child inside pushes corn through a horizontal tube. The other child reaches in to grab what the other is pushing through. Neither can see the other, but they can feel each other's actions through the tube. The complexity arises because they know where each other is but they cannot see each other. As a consequence, they have to interpret the actions of the other strictly through verbal cues and nonverbal cues to understand where the corn comes from and where it goes. In essence, to complete their actions they need to begin to grasp the other's perspective without even seeing what the other is actually doing. In the video below, a similar scenario plays out. 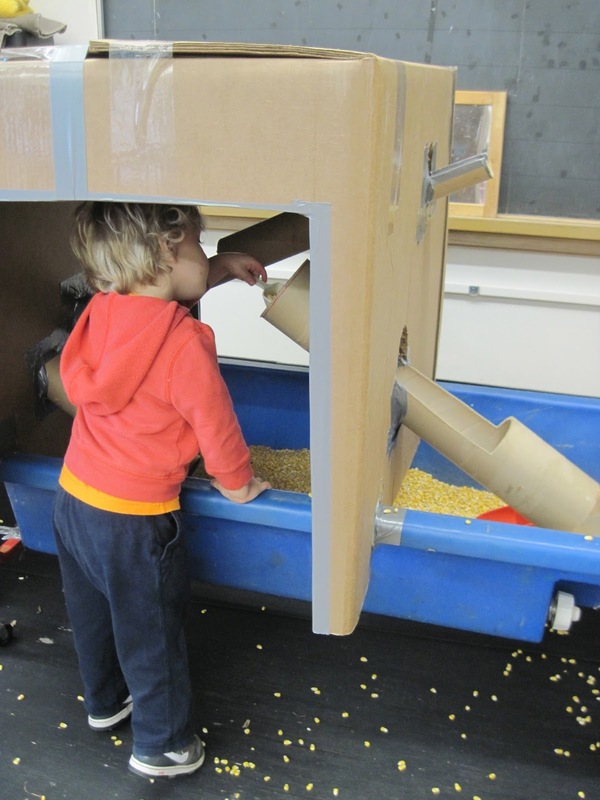 A child is pouring corn into a tube from inside the box and the child on the outside is catching it. As the video starts out, the child on the outside of the box uses a blue scoop to catch the corn. When the corn stops coming, he transfers the corn into the tube to his right so it drops back into the box. 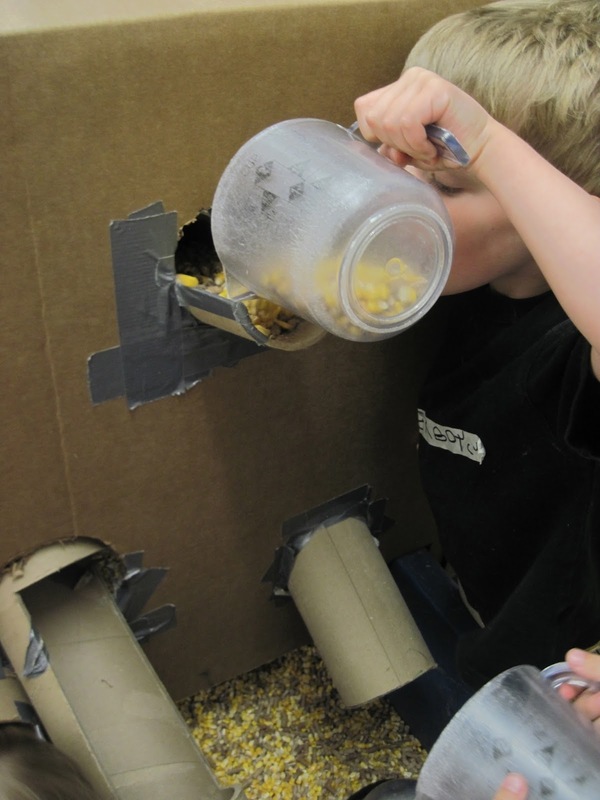 At the same time he is doing that, he anticipates that more corn is going to come out of the tube from inside the box so he uses his left hand to block any corn that comes out. And indeed it does. After emptying his blue scoop in the cardboard tube, he adeptly re-positions the scoop replacing his left hand to begin the process all over again. Corn game from Thomas Bedard on Vimeo. How does this child know that more corn is coming? Where does he think the corn goes when he pours it in the tube to his right? Does he think the corn coming out is the corn he returns to the box? There is a reciprocity in play here that forces the child to understand the actions of another. Perspective taking is essential to understanding others---and ourselves. And as the two examples above point out, perspective taking is not static. Rather, it is dynamic. It is constantly changing because either we are moving or the objects are moving or both are moving at the same time. Perspective taking requires initiation, reciprocity and imagination. And therein lies the richness of perspective taking in all domains.